The popular website Etsy allows individuals all over the world to run personal stores. Shopkeepers can sell items ranging from arts and crafts, to clothing, to jewelry, to furniture, to books, to decorations, and pretty much anything else you can think of! Etsy allows users to place their items for sale online, shop online, and have items delivered all over the world. 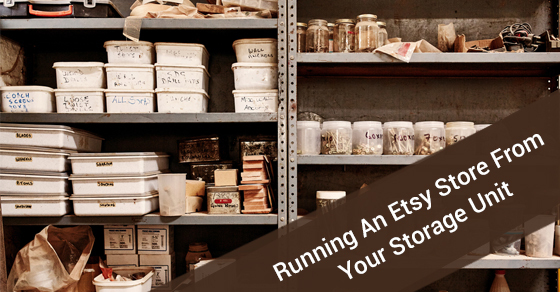 If you’re running an Etsy store, you may be faced with the issue of space. Your vintage clothing store may have outgrown your apartment, or all the tools you use to handcraft furniture may be getting in the way. What can you do? An option some Etsy shop owners have turned to renting storage units, an idea we at Jiffy Self Storage salute! Here are some ways to use your storage unit to elevate your Etsy store, and take the clutter out of your life. Certain items are easier to store than others. Before renting a storage unit, consider what kind of storage your items need. Things like clothing, fine art, antiques, books, and upholstery are particularly vulnerable to the elements, specifically mould and mildew caused by humidity. If you are concerned about the effect of humidity and temperature changes on your items, it’s best to choose a climate controlled storage unit. At Jiffy we offer climate controlled storage, with specialized fine art storage. A storage unit is a great way to get some organization back into your life! Make running your store as easy as possible by staying on top of storage unit organization. Storing smaller items in plastic bins is a great way to keep them safe and organized. Make sure boxes are clearly labelled. If you’ve got a lot of stock, you may want to go the extra mile and draw up a floor plan detailing the locations of items. The more organized you are, the easier it will be to retrieve items quickly. It’s often significantly cheaper to buy materials in bulk, such as fabric or wood. While limited space may have kept you from taking advantage of saving on bulk materials in the past, a storage unit means much more space to store extra materials. Depending on your business, a storage unit could also be a place for customers living in the area to view your stock. You may be offering customizable goods, and though you may not want strangers in your home, a storage unit provides a secure place to meet with customers.